We may be overdoing this chip thing. Perhaps we shall calm down soon. For today’s experiment we are going down to half a tablespoon of oil. Furthermore we are trying the flavoured chip, using Chilli oil. 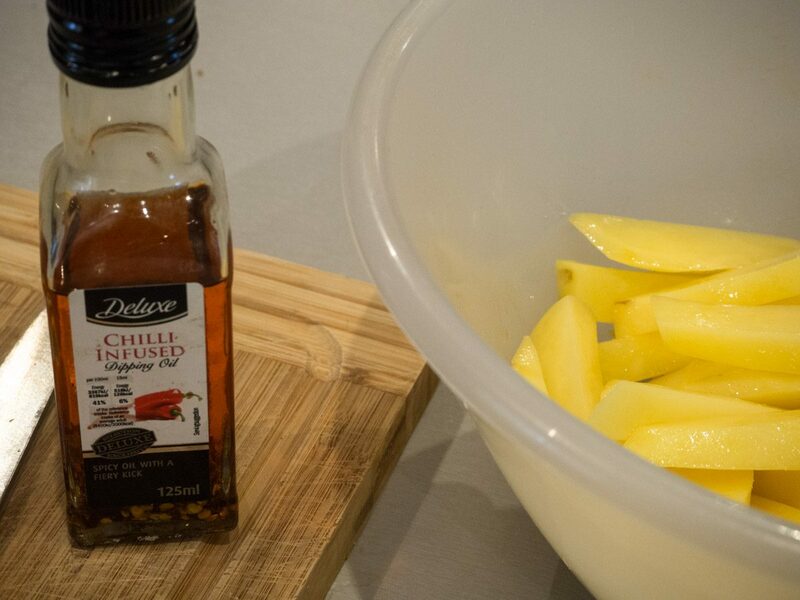 I peeled today then steeped, drained and dried, salted and added the Chilli oil. As I was using chili I elected to drop the temperature back down to 180C, not wanting hot chili smoke or steam in my eyes, nor a flavour of burned chili on the chips themselves. The Chilli Oil was from a Lidl bottle that has travelled a very long way with us. It was down to about one third full and thick with chilli flakes. A taste test suggested that it might just be a little concentrated in flavour now, so we wimped out and “cut” the oil with some plain. I reckon that bottle will go on for another couple of year snow, if I keep on topping it up. In thinking about these chips today I was reminded of the Salt and Chilli chips from the Chinese chippie in Kirkwall and now I am wondering about how I might replicate those. The bread roll test that was promised has not happened due to having bought a huge loaf of bread at yesterday’s Fete in Saint-Rémy. [Adventures with an Air Fryer] We had been considering going off in the motorhome tomorrow but the cats are not yet socialising well and we think perhaps another week of introductions might help the situation. Feliway has been ordered. Hi, Merika. I have a Philips. I understand that they first developed the Air Fryer principle. Anyway, somewhere on this blog you will find full details of the model. If the Internet was behaving for me I would track it down for you, but it isn’t.